Beyond the Studio is a podcast that focuses on the behind the scenes work of visual artists—how they're supporting and sustaining themselves and their creative work. It features candid conversations about their business practices, time management, financial planning, and how they're navigating the unique challenges of making a living, creatively. Artists are inherently resourceful, resilient, and ambitious, with a unique and diverse set of skills. We want to know how they're connecting the dots in their own life, and demystify the process. We believe that by sharing these stories openly and honestly, artists will feel more empowered and become better equipped to live out their own creative life's work. Listen and subscribe on iTunes, Stitcher, Spotify, or Soundcloud. 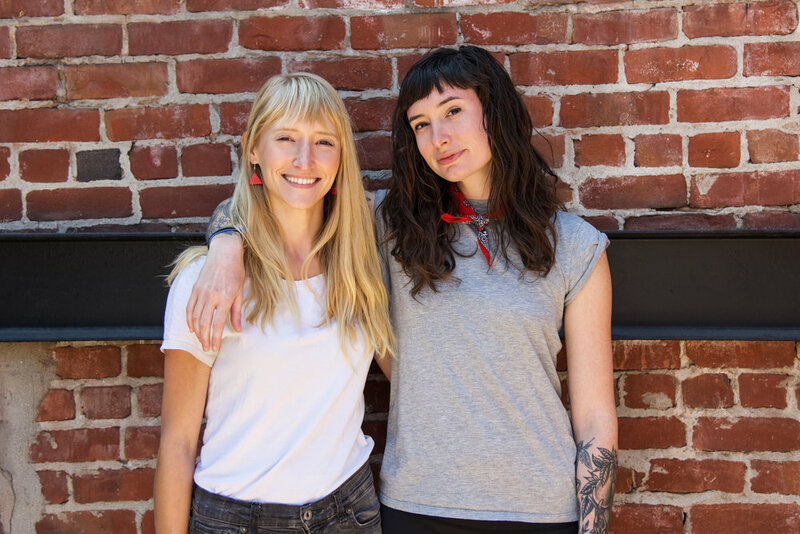 Beyond the Studio is co-hosted by San Francisco-based painter and muralist Nicole Mueller and Baltimore-based fiber artist and founder of Close Call Studio, Amanda Adams. After meeting in art school, they became roommates and close friends while each navigating the start of their own creative careers. Eight years later, Beyond the Studio was born as a way to bridge the gap between what they wish they knew then and now. Hear more about the origin story of the podcast in Episode 1. Nicole is a visual artist, creating large scale “stained glass” installations and painted murals throughout San Francisco. Her work fuses color and light into layered collages that aim to transform spaces into abstract environments that feel immersive, vibrant, and complex. She’s been an artist-in-residence at the Vermont Studio Center, Proyecto ‘ace, and Creative Paradox, and completed public projects with the City of Alameda and Salesforce Transit Center. Amanda founded Close Call Studio in 2012, a fiber and illustration brand committed to making beautiful and uplifting goods using ethical and sustainable practices. She is an illustrator, felt sculptor, photographer, pun master, and printmaker. Her work is designed to bring playfulness, joy, and humor to your home, and has been featured at Anthropologie, Etsy, and numerous boutique shops around the country. We would also like to extend our thanks to Michael York for providing the intro music to Beyond the Studio, David Colson for his work on the logo, and Jenna Trosien for her design work.